Psychologist Susan David discusses her book on emotional agility. Just like physical agility, emotional agility is important to overall health, well-being and successful relationships at work. But in a fast-paced world fraught with so much stress and upheaval, how do you achieve it? 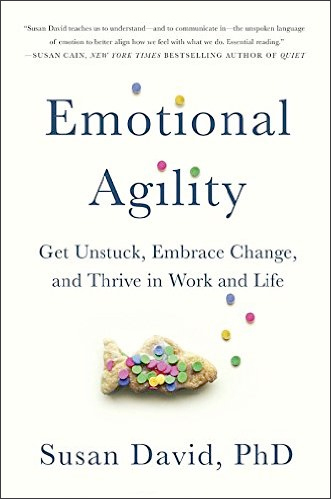 Psychologist Susan David, a lecturer at Harvard Medical School, offers insights in a new book titled Emotional Agility: Get Unstuck, Embrace Change, and Thrive in Work and Life. She spoke with Knowledge@Wharton about the “critical skill set” needed to achieve emotional balance on the Wharton Business Radio network on Channel 111 on SiriusXM Radio. Knowledge@Wharton: What is emotional agility? Susan David: Effectively, it’s the ability to be able to be with your thoughts, your emotions and your stories. We all have thousands of these every day in a way that enables us not to be derailed by them, but rather brings us intentionally and with purpose towards what we value in our lives. Knowledge@Wharton: Is getting derailed something that happens to most people on a daily or weekly basis? David: Absolutely. It’s not simply getting derailed in anger, for example. But we all have ways that we want to live, ways that we want to parent, how we want to be in our relationships and how we want to be at work. Yet we often allow ourselves to get derailed by not being in an effective relationship with our thoughts and emotions and stories. Knowledge@Wharton: Is this book based on the research that you’ve done over the last couple of decades and examples that you’ve seen firsthand? David: Yes. I am a clinical psychologist by training. I’m on faculty at Harvard Medical School and co-founder of the Institute of Coaching at McLean Hospital. A lot of my work is both drawn from my research in emotions and the work that I do with clients and with organizations. Knowledge@Wharton: You have a list of key ingredients for people to think about in trying to reach that level of emotional agility. What is on the list? David: Firstly, emotional agility is the ability to be with yourself in a way that is courageous and curious and compassionate. This involves a number of strategies and core competencies. One of them is being able to not struggle with your thoughts and emotions. The reason that I say this is because people often will have an experience where they feel undermined at work or they’re not liking their job or something happens in their world. Instead of being able to move forward around that situation, we almost jostle and engage in an internal struggle about whether we should or shouldn’t feel or think a particular thing. I shouldn’t be unhappy because at least I’ve got a job. Or we try to rationalize our thoughts and emotions away. We know that this is not an effective way of actually facing into what is going on in our lives. Knowledge@Wharton: One of the things you bring up are the values that people rely on, things that are core to them and how important they are to the process. David: One of the first things that I talk about is how putting on a brave face often counters our ability to look beyond our emotions and our difficulties to discern signposts of what it is that we care about. The things that we are upset about or angry about often contain information of what’s of value. I’m unhappy about my idea being stolen because, underneath that, I really care about issues of equity and justice, for example. People will often push these emotions and, with them, the learning aside. Really having a clear sense of what it is that is important to us is absolutely critical. Values are often seen as being cheesy, the kinds of things that we have on walls in organizations but don’t really believe in or do anything with. Yet what’s fascinating is the amazing work showing that when people have values front of mind, it is protective in things like transitions. If you’re going through a difficult period at work, you’re a first-generation college student, you’re having a struggle in a relationship, knowing how you want to be in the world protects us from social contagion. It protects us from a lot of the mindless comparison that we often do. And it’s really a fundamental part of our ability to be well and happy and productive people. But absolutely, we live in this society that makes us second guess ourselves when things go wrong. The natural consequence is that we want to push these things aside. Psychological research tells us that the very thought that we try not to think about will often have a boomerang effect. We’ll think about that exact thought something like 30 or 40 times a minute. You try not to think about chocolate cake because you’re on a diet, and you dream about it. So trying not to think about or navigate difficult situations doesn’t work. And secondly, it doesn’t allow us to mine the learning and make constructive change to our lives. Knowledge@Wharton: You also talk about the idea that emotions tell you a lot about yourself. They communicate the type of person you are. How important is that in this process? David: It’s critical. Charles Darwin wrote a lesser known book called The Expression of Emotion in Men and Animals. In this, he really talks to the idea that emotions help us not only to communicate with other people but also to ourselves. This is a critical aspect of my work and of the book itself. This idea that we can learn underneath our emotions, if we feel a sense of guilt, if we feel a sense of anger, there’s often something that is instructive to us. Now, the very clear distinction here is that our emotions are data, not directions. We can learn from them, but we don’t need to obey them or be dominated by them. In the book, I talk about this idea of showing up. But I also describe the critical skills that I call stepping out, the ability to feel a feeling or think a thought and almost helicopter above it. We’ve all had that experience when we’re really angry with someone, we’re frothing at the mouth with a customer service agent who’s gotten our bill wrong once again. That ability to both feel an emotion but to almost helicopter above it is a critical skill set for us and our children. It helps us to be healthy and well and to not ignore emotions. [A quote often attributed to well-known psychologist Viktor Frankl said it best:] Between stimulus and response, there is a space. And in that space is our power to choose. It’s in that choice that comes our growth and freedom. Knowledge@Wharton: Is this important for kids as well? David: By 2030, depression is targeted to be the single cause of disability globally, outstripping cancer, outstripping heart disease. And the increase in psychological illness in children is just frightening. In a changing world, children really need to develop the skill set to be able to navigate their emotions efficiently and learn that their emotions are not bigger than them, that they have strategies and skills. I spend a whole chapter in Emotional Agility describing this skill set in very practical terms that children need. Knowledge@Wharton: Is there a generational difference in how millennials act today compared with how the Baby Boomer generation did 30 or 40 years ago? David: There are particular strategies that people use by default. In the book, I talk about boxing emotions, which is just pushing them aside, and brooding on emotions, which is dwelling on them. For those, the research doesn’t seem to indicate that there are generational differences. But some of the generational differences that do come in are when we grow up in a world that tells us that we can fix everything and there’s an app for everything. We can start learning or being messaged that if we don’t like our emotions, we can simply just fix them. And you know that some things can’t be fixed. Some things need to be carried, and they need to be carried effectively. Life’s fragility is inseparable from its beauty, and its beauty inseparable from its fragility. For millennials, there’s really a focus here on helping people to not just try to fix stuff in a very gloss-over way, but helping people to label and understand, and discerning a sense of what is important to them is really critical. Knowledge@Wharton: What about the differences between men and women? David: There are really interesting differences. Again, it doesn’t mean that everyone fits into these categories. But we certainly know that men tend to do more of what we call bottling emotions. This is the idea of pushing it aside. I’ve got a project to do, so I’m just going to get on with it and ignore the upset in myself or my team, or my disaffection or dissatisfaction. Women tend to do more of what I call brooding or co-brooding. Brooding is where you analyze and think about and dwell on, “Why is it that I’m feeling what I’m feeling?” Co-brooding is when you do that with someone else, you go out to lunch with your best friend and you talk. Brooding or bottling look so different. The one is ignoring emotions; the other is dwelling on emotions. Yet both are interestingly associated with lower levels of ability to deal with stress, to be productive and to solve problems. Knowledge@Wharton: How do people get around the occasional bad mood? David: An important thing is to recognize that sometimes the difficulties and negative emotions that we experience truly help us. We know from research in this area that when we’re in a more positive mood, it tends to help us to do particular kinds of thinking — creative, big issue, problem-solving and so on. But our more negative moods help us to analyze, contingency plan, edit. For example, for someone giving a pitch to a client, the idea of how a positive mood might help that person to be creative in terms of how to connect and be relational and effective with a client is really important. But the negative mood can help us to contingency plan, to think about what might go wrong with a project. The first aspect of this is to be able to be with our thoughts and emotions instead of struggling with them. In the book, I also talk about how you develop strategies that help you to rise above those emotions, step out of them. For example, very often a person who’s stressed will say, “I’m stressed.” And then the next day, “How was your day?” “I’m stressed.” What’s fascinating is there’s a difference between stressed versus angry or stressed versus upset or stressed versus disappointment. We know that people who are able to be more granular, who are able to label that stress accurately for what it is, that it actually alters the readiness potential. That is, from a neurological perspective it helps us to develop strategies and problem-solving. Just this idea of being able to label an emotion is incredibly transformative and powerful. Knowledge@Wharton: When you talk about how depression is going to increase in the coming years, how is that connected to technology and social media? Are we going to have kids who are unable to connect in a social aspect because of technology? David: There are very complex reasons as to why we’re seeing these statistical changes. Some of it is about identification. But there are other reasons that effectively indicate that when we live in a society in which there is so much change, so much technology and a huge amount of ambiguity, it’s almost like our brains haven’t evolved effectively to tolerate and deal with the speed of these changes in the way that we need to. But there are other aspects of this. There’s this huge conversation that goes on about helicopter parenting, which often sounds like it’s this thing that we do on purpose. But most parents want to help their children to feel better. When a child comes home from school and feels rejected, most of us, not with the intent of helicoptering, but with the intent of comforting and being warm, will run to our kids and say, “It’ll be okay. How can I help you? Let’s go bake cupcakes together.” What we do in that context, even though we do it with excellent intentions, is we often take away our children’s ability to sit with their emotions, to recognize that emotions pass, to be able to label emotions and develop strategies around emotions. In some ways, I think the answer is fairly complex. But certainly, we know that when one is on a phone all the time, one is often not developing real connections. Social support is a critical buffer in stress in people’s lives, so I think there are complex and interconnected reasons here that are really important. Knowledge@Wharton: When people are in a job, sometimes they are thinking forward in terms of their career, but a lot of times they don’t. You talk about that need for people to continue to think forward about their careers. David: In Emotional Agility, I describe the idea that we all develop narratives. Some of these narratives were written on a mental chalkboard in third grade, and some were written in our first job. These narratives are helpful. They help us to make sense of our world. From a psychological perspective, they serve a critical purpose. But we start to get into what I describe in the book as premature cognitive commitment. This idea that we prematurely decide that there’s a particular job that we really would love to go for, but we aren’t cut out for it. Or there’s a project that we don’t put our hand up for because of some internal narrative and reasoning. I describe this critical need to recognize your story and recognize your narrative, but don’t let it own you. We can actively choose to re-navigate that narrative because we’re more than just one story. We’ve got many stories. But sometimes one story starts to take center stage in our relationships at work or in what we put our hand up for in ways that really don’t serve us or our values or who we want to be in the workforce.